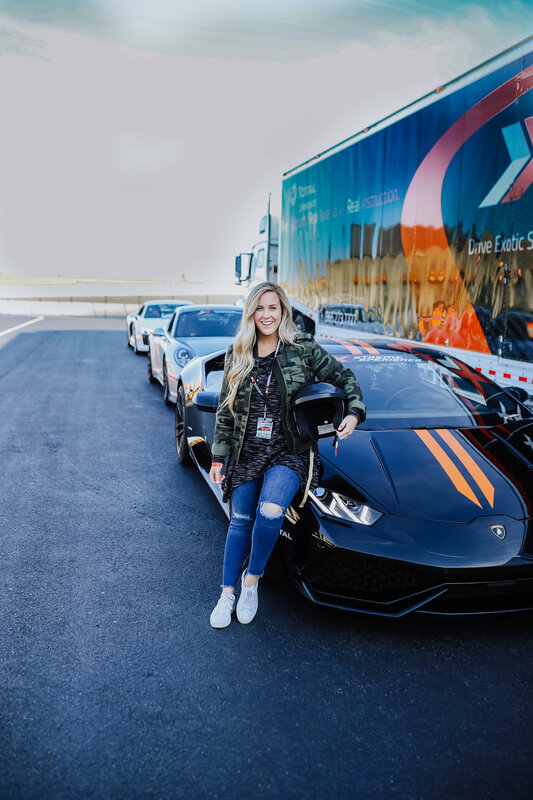 Ever dreamed (or in my case, have a husband that has always dreamed) of driving a beautiful, exotic car 90+mph on a racetrack? Xtreme Xperience is definitely for you. 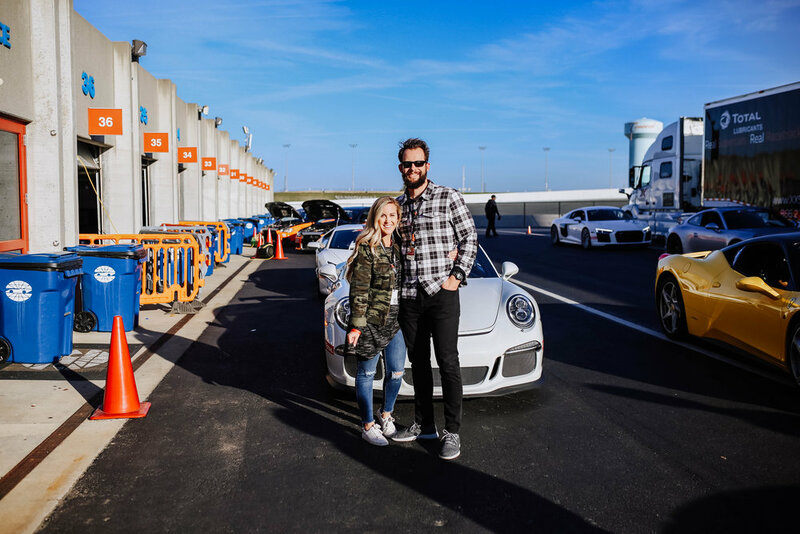 I surprised Ben with an early birthday present (He's turning 30 so it had to be big) of driving the car of his dreams on the track at the Charlotte Motor Speedway. Ben had the BEST time and I even got to join in on the fun. We arrived at the track and got all checked in with the friendly and helpful Xtreme Xperience team. They then sent us over to a quick 30 minute introduction and safety course. It was great to learn about these cars specifically and how they handle compared to regular cars on the road. We also learned a lot about the track to get a better understanding of the specific route we would be driving. After the class we headed straight to gear up for our drive! Due to nerves, I opted to ride alongside one of the professional drivers instead of driving the car on my own. In my opinion, this was PERFECT for me, because I went SO much faster than I would have ever gone on my own and it was such a blast. I literally felt like I was on a roller coaster and it was so much fun. We drove the Porsche 911 GT3 and I am trying to convince Ben to get me my own one day (dreams are always good to have, right?). Ben, the tough guy that he is, drove the Audi R8 V10 and loved every second of it! When you drive the car, you are alongside a professional driver who coaches you through the course. They are there to encourage you to go push it on the straight aways (you can go as fast as you want) and also there for safety incase something were to go wrong. I loved this because I knew Ben was safe the whole time he drove. 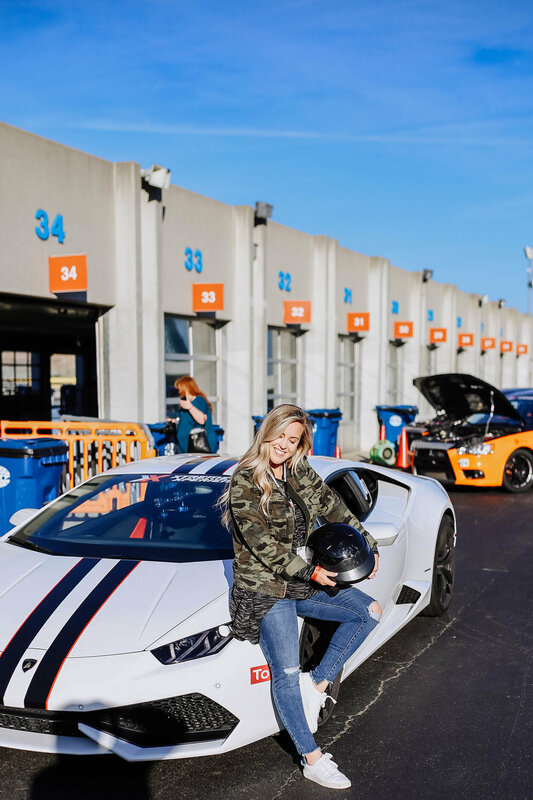 He said it was crazy to be driving the car of his dreams on the Charlotte Motor Speedway track. Race car driver in the making? I cannot recommend Xtreme Xperience enough! 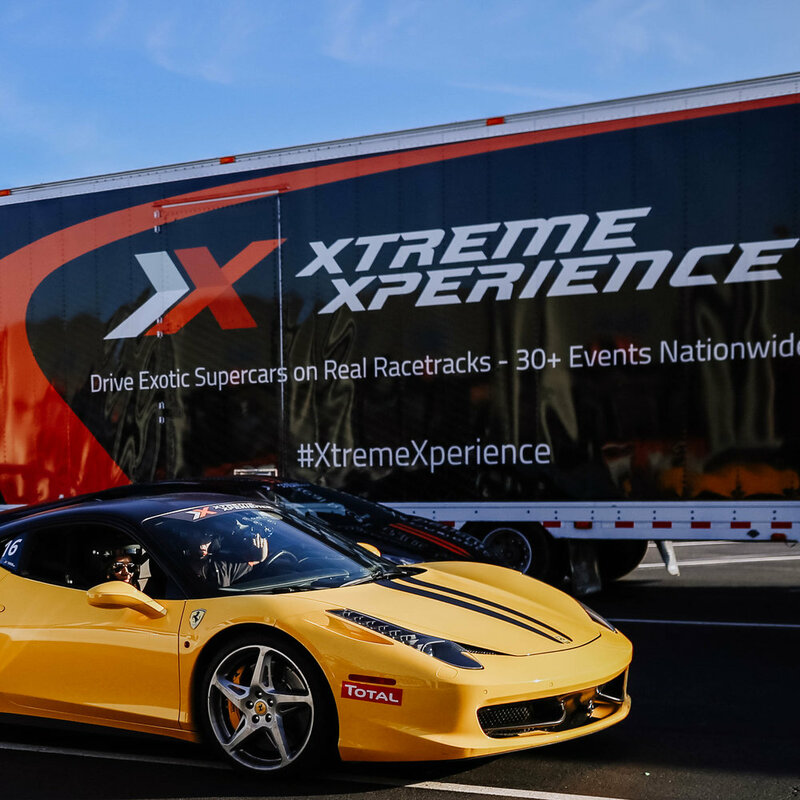 If you are looking for the perfect gift for the adrenaline junkie or person in your life who has always wanted to drive an exotic car, look no further than Xtreme Xperience! Father's Day is just around the corner and it would be the GREATEST gift for any day! Head here to check out their tour locations and dates to find the closest track to you. Ben Perdue, I'm thinking a trip to Seattle for the September 28-30 event might be in our future! 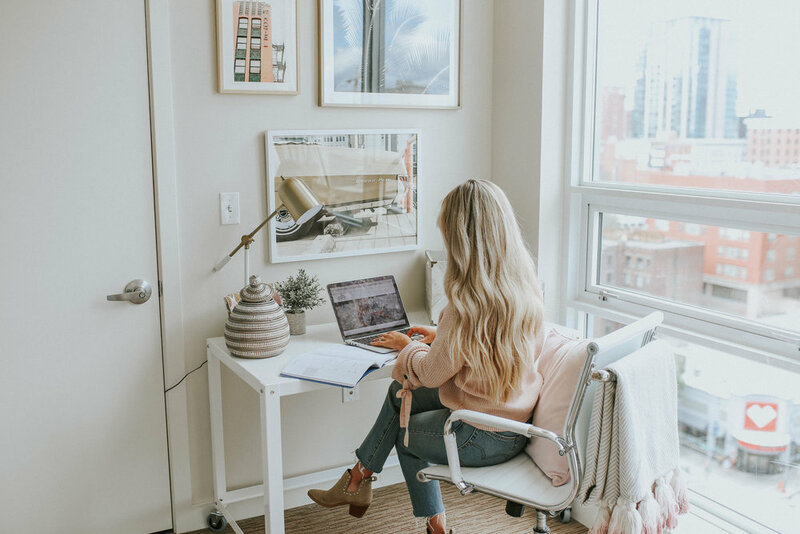 OK, I realize this took me wayyyyyyy too long, but I am so excited to FINALLY share my Seattle apartment with you guys starting with my home office tour. 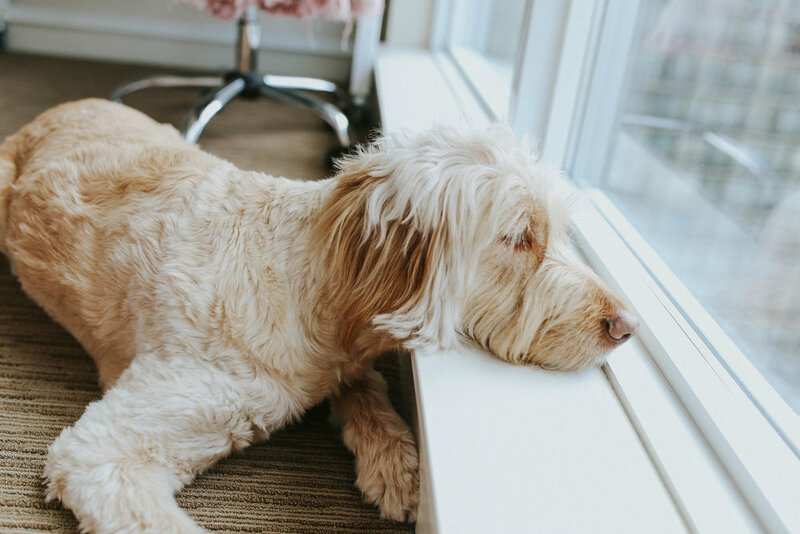 It's been so fun to have a space that is all my own (although often times taken over by my husbands junk-we only have 900 square feet people) and allows me to be inspired and create for you guys. It's definitely small and being taken over by clothes, but I love it! As you will see from the rest of the apartment, we went with a netural bohemian theme. My office has tons of natural light (when it's not raining) and was pretty easy to decorate considering the size. I basically have one wall in the office that isn't a sliding door or windows, so I knew it needed to make a statement. 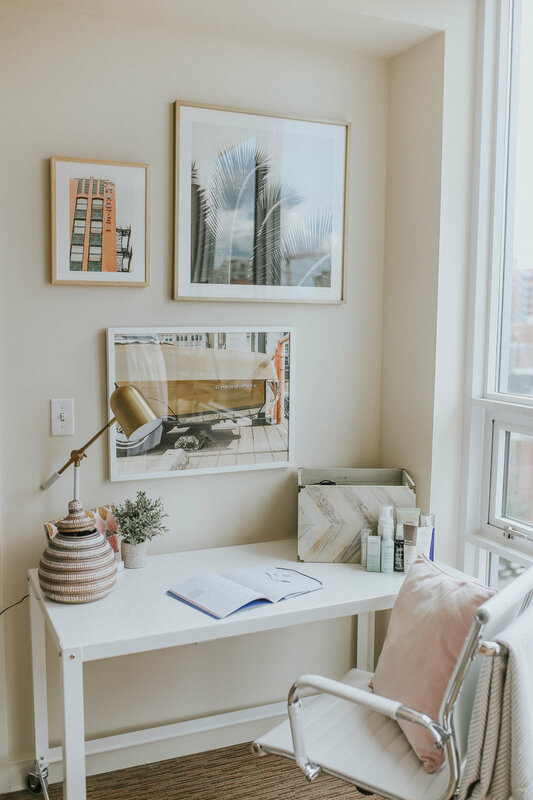 I have always loved gallery walls but have never been confident in my ability to style one, so I called upon Minted and their personal art styling service. 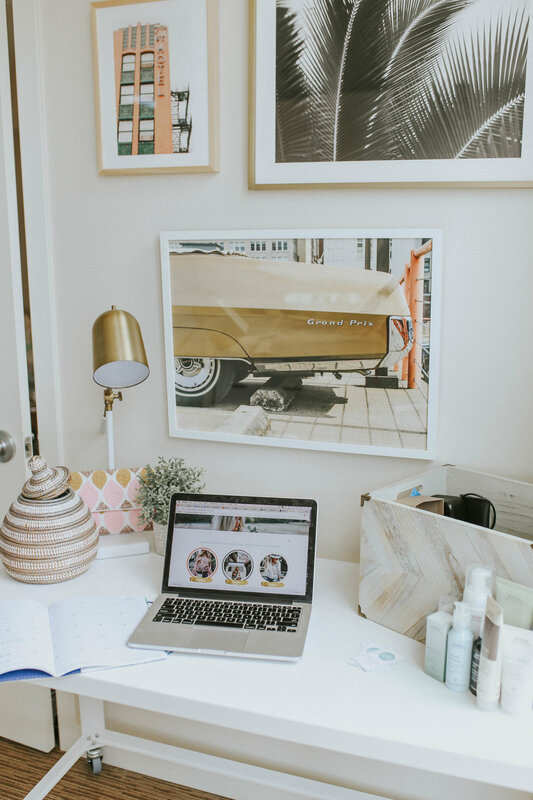 The Art Styling Service from Minted is seriously amazing! 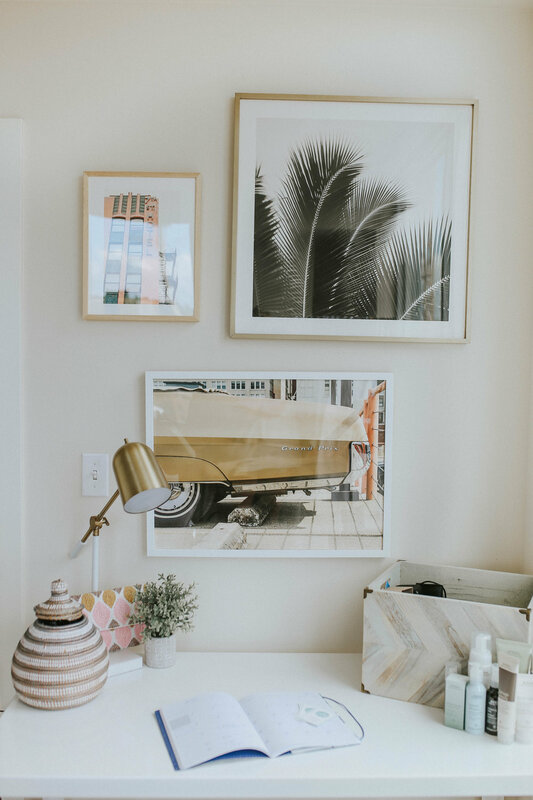 It's super easy and convenient and before you know it, you will have a perfectly designed gallery wall. 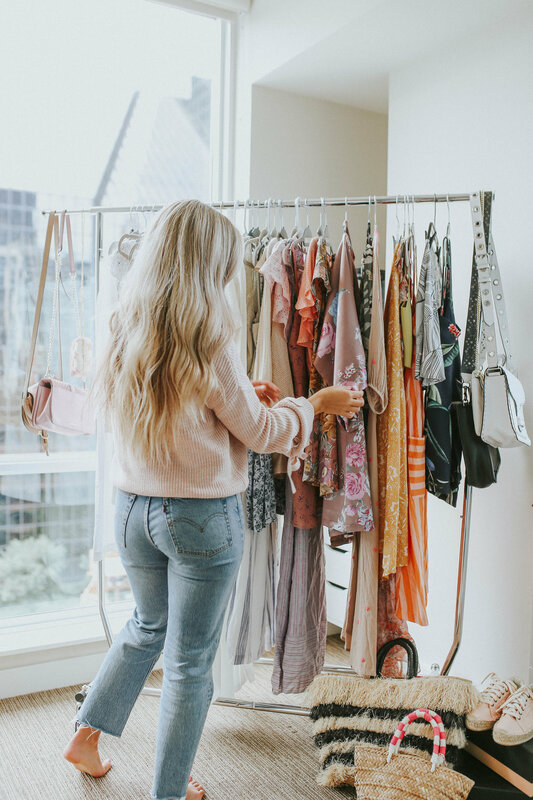 I simply took an easy style quiz so my designer could have an idea of my personal style and get a taste for the things I liked. Next, I uploaded photos of the exact space where I wanted my gallery wall to hang (iphone photos worked perfectly). My stylist (Kathlyn-she was amazing) then sent two options to choose from. She included pictures of what they would look like hung on the walls so I could visualize for myself. Kathlyn did an amazing job and I actually loved both choices, but I ended up going with the second option because it had a little more color. 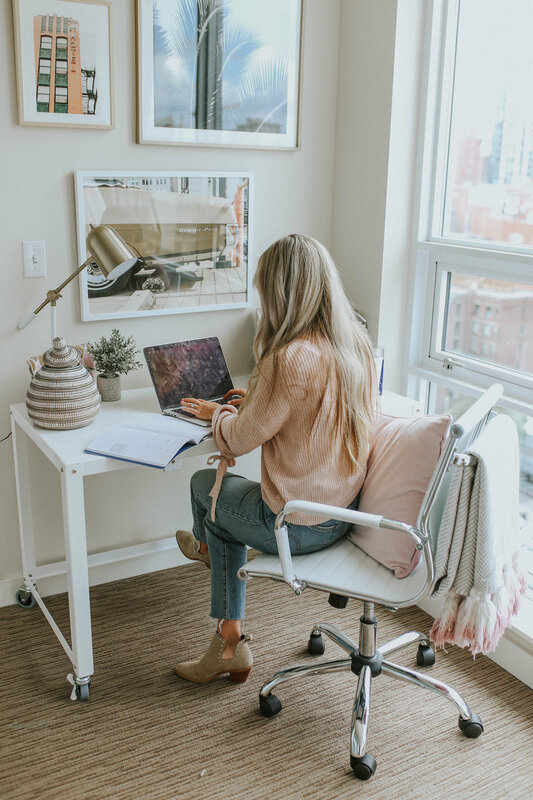 I didn't include much color in my apartment except for subtle pops of blush pink, so I decided to be a little bit more adventurous with my office. Also, I immediately fell in love with the vintage car print. This design reminds me of Old Havana which is definitely on my bucket list of places to visit. After I made my choice, I sent Kathlyn the dimensions of my wall and she sent back the correct sizes for each piece of art. 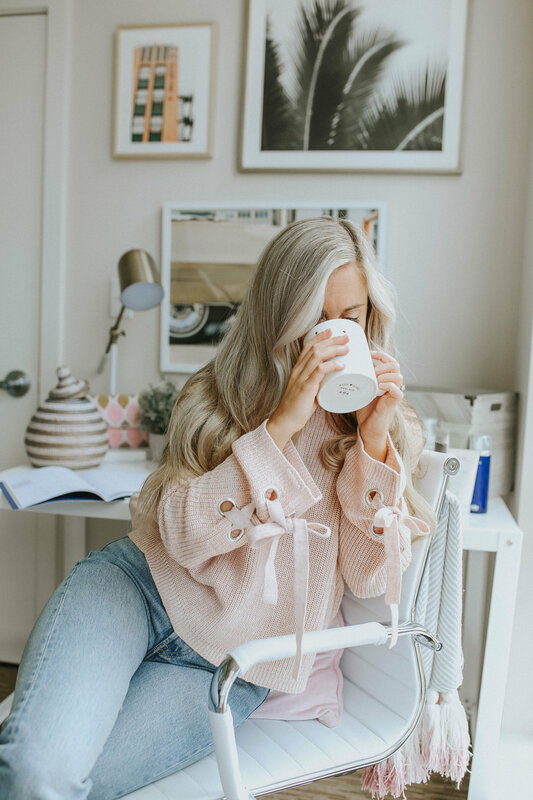 Kathlyn then placed each of the items in my Minted shopping cart. This was super helpful because I simply had to checkout (I didn't even stress about making sure I had picked the right sizes). After about a week, I received the art and Ben and I hung the pieces according to the directions outlined from Kathlyn. Seriously, the whole process could not have been easier. It was SO helpful to have someone put together a gallery wall for me without all the stress. Especially for a girl who has a hard time making decisions when it comes to home decor. I am in love with the way it turned out and can't wait to show you the rest of the pieces we picked! The Minted art styling services start at just $79 for an art wall and $99 for an art room! It's seriously like having your own personal interior designer minus the insane cost. I couldn't recommend it more. 10 Things to do in Nashville! 1. Have dinner at Butcher Town Hall in Germantown. Germantown is one of the newest "hip" areas in Nashville and Butcher Town Hall is definitely at the top of the list of places to eat. Go with friends and order a few small plates and tacos to share. The guac is out of this world and the carnitas taco is amazing. 2. Treat yourself to the uncommon goods @ White's Mercantile. This inconspicuous looking little store is no Mast General Store. Stop in and browse the shelves filled with a mixture of Rag and Bone booties, luxe beauty products and vintage kitchen gadgets. Make sure to try on one of their wide assortment of awesome hats! 3. Browse the plants at the Flower Basket on 12 South. This cute little pop-up gardener's paradise comes to 12th South for a limited time during April and May. If you are lucky to catch it, make sure and stop by for some beautiful scenery. 4. Buy a pair of custom jeans at Imogene + Willie. What could possibly be better than a pair of custom jeans? 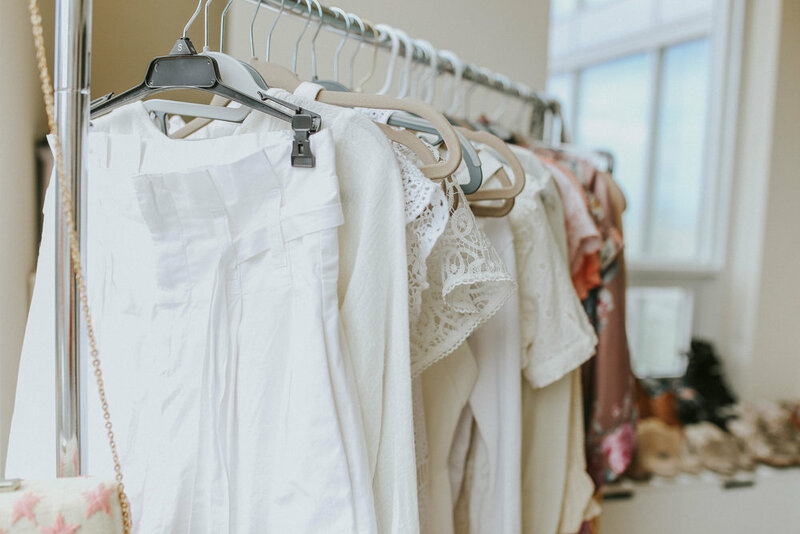 This store has it all; find everything from Warby Parker sunnies to awesome vintage finds. The decor in itself is reason enough to visit. 5. Stop by Barista Parlor in East Nashville or Golden Sound in The Gulch and order an Iced Bourbon Barrel Vanilla Latte. Your life will forever be changed by this amazing coffee creation not to mention the creative vibe in this East Nashville original. 6. Spend the afternoon/evening at Pinewood Social. More commonly referred to by my sister as the "hipster country club," this hip restaurant/bar/coffeeshop/bowling alley/ Palm Springs resort is the perfect place to spend the day. Start by ordering one of their creative cocktails and bring it outdoors to sip poolside in a comfy lounge chair. Head back inside for a fabulous dinner capped off with a round of bowling. This is one spot you cannot miss! 7. Dine at Taqueira del Sol. The tacos are good, but the cheese dip is AHMAZINGGGGGGG. My suggestion, order a taco, margarita and an entire bowl of queso for yourself. I promise you will not be disappointed. 8. Stop for a Photo op at the "I Believe in Nashville" sign. This may be cliche, but everyone's gotta do it! 9. French Toast @ Jackson's Bar and Bistro in Hillsboro Village. In the mood for brunch? Dine at Jackson's and be sure to order their french toast. Don't plan on saving any calories because you will essentially be eating a funnel cake doused in syrup. YUM! 10. Visit Posh Boutique. Ok, I threw this one in because my friend Zoe works there and she is the best, but they seriously have tons of cute clothes and shoes. And most importantly, do all of these things with the people you love the most!